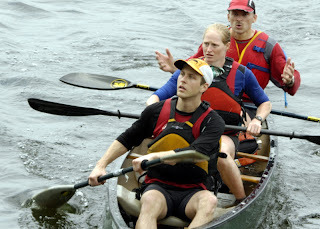 Here's a photo from the 12-hour race this past weekend in Dover, VT. Your trusty Team ARFE-SmartWool finished second, but ended up third to SPTU due to a time penalty for missing a piece of mandatory gear. I love this photo. It's proof positive that even the best of the best sometimes get confused when it comes to taking out a boat on rocky (durable! LNT principle number one!) terrain. Big thanks to Joe and Kelly for both the crewing and the photos. More can be viewed here: www.jaubs.com (just click on the "welcome" at the bottom of the photo).